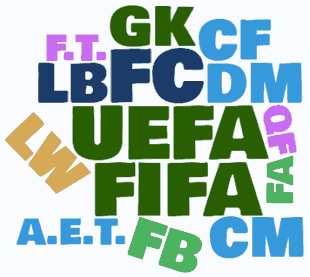 Here is a collection of abbreviations that increase your understanding of the game of football (soccer). You may come across letters together like CM, DM, QT, L and A. Send an email if you miss something on the list. SW – sweeper. A player with both defensive and offensive tasks. He is given a free role and can serve in some degree as a playmaker and should also fall back behind the defensive line when the opposite side attack. CB – center back. Normally one or two center backs are used in a formation. CF – center forward. The attacker that is positioned in the middle of the offensive line. In modern football it has become common to only use one or two attackers; therefore a center forward may not be quite relevant as a description. LB – left back. Is positioned on the left part of the defensive line. RB – right back. Is positioned on the right part of the defensive line. FB – fullback. Another name for the defensive player that either plays on the left side (left back) or the right side (right back). LWB – left wing back. Positioned in front of the left back and out on the “wing”. RWB – right wing back. Positioned in front of the right back. GK – goalkeeper. Often only G is used. LW – left wing, similar to the left wing back, but usually with a primarily offensive task. In other word an offensive wing midfielder. RW – right wing. The same as the left wing, but on the opposite wing. WF – wing forward. An attacker in offensive position on the wing. As with the center forward, the wing forward has been less common in the modern game, but could be present in a 4-3-3 formation. ST – Striker. A similar function as the center and wing forward. IF – Inside forward. In the old days an offensive line could consist of five attackers and include two inside forwards that were positioned between the wing forwards and the center forward and normally a little behind the other three. OL – Outside left. Same as left-winger. OR – Outside right. Same as left-winger. A – Away. Common in tables. A.E.T. – After extra time. Means that the result concerns a game that has used extra time to decide the outcome. So for example, 3-2 A.E.T. should be read as the final result after 120 minutes. Sometimes both the result after 90 minutes (ordinary match time) and the result after extra time are written out. AW – Away win. In other words, the team that played away won the game. The opposite to home win (HW). D – Draw (draw games). It is common to use this abbreviation in tables. E.T. – Extra time. Additional time that is used in some cup games when the standing is a draw. Not the same thing as added time due to injuries and other delays during the match. F.T. – Full time (i.e. after 90 minutes including added time). Often used when presenting results. Compare with half time. Gls. – Goals. Sometimes used in databases. GD. – Goal difference. +25 would hence mean that a team have made 25 more goals than scored against it. H – Home. Common in tables. H.T. – Half time (i.e. after 45 minutes in a football game). Compare with full time. HW – Home win. In other words, the team that played on home ground won the game. L – Loss (lost games). It is common to use this abbreviation in tables. P – Played (games). It is common to use this abbreviation in tables. Vs. – Versus (could also be abbreviated with only v.). This is related to all kinds occasions when a team meets another, like in Brazil vs. England. W – Win (won games). It is common to use this abbreviation in tables. w/o – Walkover, which means that a team wins without a contest, for example due to the other team withdraw from competition. AFC – Association Football Club. A common abbreviation for British clubs. Apps – appearances, which refer to the number of matches a player has participated in. FC – Football Club. A very common abbreviation as a part of a clubs name. This abbreviation can differ depending on the language. In Spain, for example, it's common with the abbreviation CF, which stands for Club de Fútbol. SC – Soccer Club, not as common as FC in names of clubs. CL – Champions League (not an official acronym). FA – Football Association. The English football association that was established in 1963. FIFA – Fédération Internationale de Football Association. The international governing body of the game of football. UEFA – Union des Associations Européennes de Football. The European governing body football and most powerful after FIFA.